Home » Angels and Demons » Anti-christ » illuminati » Lady Gaga » religion » Robert Langdom » Society of Masons » Lady Gaga: The Illuminati puppet? Lady Gaga: The Illuminati puppet? And who wouldn’t agree with me if I say, Lady Gaga is oozing with coolness! Don’t you love seeing her attending a graduation rites wearing outrageous outfit. Or walk with that boots resemblance to a ram’s foot? Cool huh! Now, how about hearing this? Ofcourse, you may have heard about the Illuminati, the brotherhood of Masons and the secret societies of the ancient time that believed to exist in our time - the present time. So you are really clueless about the topic, huh? Oh come on now don’t tell me I have to call Robert Langdom or summon Da Vinci from his tomb! Okay on to the topic, as usual I’m in Facebook when someone in my friends list posted in his wall about Lady Gaga being an Illuminati puppet. I heard about the Illuminati in the pages of Dan Brown’s ‘Angels and Demons’, being a secret society assumed to have composed of really rich and powerful entities that still exist in the present time. It came from a radical group founded in Bavaria in 1776, that in English translation, the group’s name simply means ‘the people of the light’. This group, for years was a the prevailing subject of some conspiracy theories and said to have influenced the modern time. In the past, the group was closely associated with the Society of Masons who mostly composed of high priests but due to conflicting religious beliefs, the latter parted ways, as most Illuminati members were atheist. Today, Illuminati and the church are of mortal enemies. Known for being manipulative that even inteferes the affairs of one’s nation or the world’s government in general. In the modern day, most conspiracy theorists believe that Illuminati have controlled and manipulated world’s important events and the masterminds of the so-called New World Order (NWO). Now back to Lady Gaga and what is her connection to the group? The way she act, the way she dress, the way she accesorise and carries herself. Do you think it’s all about her dumbness? Nope, folks! Lady Gaga is up for a mission (oh well, that’s according to them, it ain’t from me seriously lol). So what if she’s an illuminati? As for my little understanding about the Illuminati; the subject is to complex that I swear, you can’t identify the fiction from the truth. So my take on this illuminati is somewhat a hearsay version, lol. So, any idea why the church is dreading the illuminati, and why they spearheaded the negation of Project MK-Ultra? Project MK-Ultra was the code name for a covert illegal CIA human research program, a US government project run by the Office of Scientific Intelligence, that used US and Canadian citizen as its tests subjects. That involved surreptitious used of many types of drugs and other method to manipulates individual mental states and to alter brain function. And although the program was abandoned ages ago, still some project in the likeness of Project MK-Ultra sprouting, which believed funded by the illuminatis. Take Project Monarch for example, a mind control technique which exposes subject to a trauma so violent that its mind creates dissociation until brain becomes compartmentalized and a new personality, which is then molded and educated by the manipulators, emerges. Subjects are said to have exposed on various symbolisms that evidently very illuminati. So what about Lady Gaga. Well, the article simply suggests that Lady Gaga was a Project Monarch veteran, lol so that makes her an illuminati puppet. And she was here not to entertain people with her music but to hipnotize er, I mean to influence the world on their grand quest to rebuilt it, forming the New World Order. By the way, rumor has it that the Anti-christ is the puppet leader of the illuminati. Now here are the illuminati symbolisms that linking blatantly to Lady Gaga. Let’s starts with her name, Gaga which means absent-mindedness and believed to have inspired by Queen’s song ‘Radio Gaga’ who’s music video uses clips from the movie ‘Metropolis’ of manipulated robot who turns into an alluring woman. Her Logo, a headless female with a bolt of lightning going through her and exiting to her genital. The logo said to imply, that the lightning bolt charges a thoughless body with force to give it life (trauma-based mind control is often induced using electro-shock treatment), hmp smells like Project Monarch, lol. The All-seeing-eye symbolism. This is the most recognizable symbol for illuminati. Known to be the Eye of Horus. And as if she just trying to make herself more cute by hiding one of her eye, as these photos would show it. 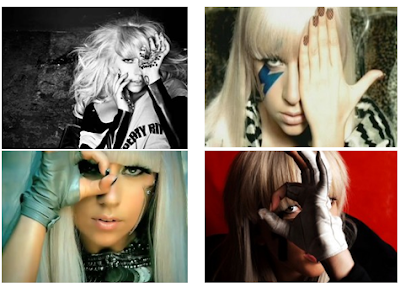 Click here for more of the explanation about Lady Gaga, using all-seeing-eye symbolism. Her music videos. Almost all of her videos uses occult symbolism and some hints on mind-control. Paparazzi for instance, in the bedroom where Lady Gaga and the man is getting on but take a look on the background, a Masonic checkered wall pattern is evident with a head of a ram that is a sysmbol of ‘Satanism’. For more of the explanation click here again, it's quite lengthy you know, lol. I really don't know what Illuminati is but I know what Lady Gaga is-her name speaks for herself. Although, her actions and her appearance seem to be "gaga", I pray her heart is not.